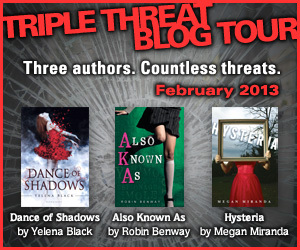 Welcome to our stop along the Bloomsbury Teens Triple Threat Blog Tour! I've (Jana) already participated in this tour on my own blog for Dance of Shadows, and am super excited to have Megan Miranda here today for a special guest post, Broke and Bookish style. Megan knows how much we love our top ten lists here, and has decided to participate with her own list on the top ten things she loves about her book! I'm petty sure she will inspire you to dash away from your computer and run to the nearest bookstore. Thanks for stopping by, Megan! 1. The first line. “My mother hid the knife block” was the prompt I gave myself to set the tone and get started. I had a very vague sense of the premise, but a pretty good idea of characters. Surprisingly, the line made it all the way through to the final draft. 2. The relationship between Mallory & Colleen. Colleen may have been my favorite character ever, and the bond between the two of them is the element I love most about the story. 3. 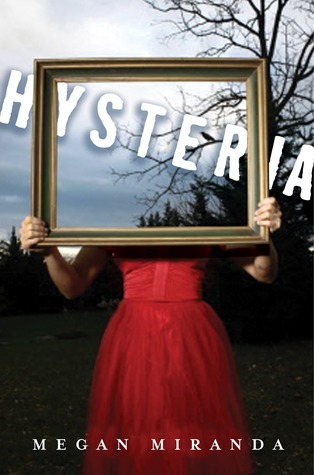 The cover. Both the US and the UK versions. I adore them both. And even though they are very different, they both fit the story so well. 4. Reid. I like him a lot. So does Mallory. 5. The combining of past and present storylines. This wasn’t something I set out to do at the start of the book, but it became obvious that what had started out as a series of flashbacks was becoming a story of its own, and that both storylines would, eventually, intersect. I loved that moment when I realized how it would happen… and what it would mean. 6. Using familiar settings. I grew up in NJ and spent a lot of time at the shore each summer, which is where the story begins. But I also went to a boarding school (though not in NH, like this story, and my school was nothing like Monroe), and spent a lot of family vacations hiking in NH. I combined the two a bit (and upped the creep factor) to make the second setting. 7. There’s a reference to an Edgar Allan Poe story in the first chapter. I loved reading his stories when I was in high school, and there’s definitely an influence from it in here. 9. Writing the “unknown” factor: I love elements that are unknown in books—where you’re unsure if something is really happening, in some paranormal way, or if it’s only happening in the character’s mind… and it was really fun to be on the writing-end of it this time. Cool. I tried to get the ARC for this, but alas...it's definitely going on the TBR. Whеn І initially commеnted І clicked the "Notify me when new comments are added"
same comment. Is therе any way you can гemove me fгom thаt service? Hi! I could have sworn I've visited this blog before but after looking at many of the posts I realized it's new to me. Anyways, I'm definitely delighted I came across it and I'll be bookmarking it and checking back frequently!